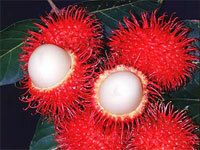 Intro: The name rambutan comes from the Malay word “rambout” meaning hairy. Rambutans grow in large clusters on the tree. Excellent for decorative purposes. Variety: Classic Red, R9, Rongrien, Yellow and Pink.